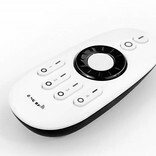 RF CT Color temperature ledstrip controller with RF 2.4F remote control. Multizone prepared. Mix warm and cold white ledstrips in a variable fashion and dim them to a suitable level. 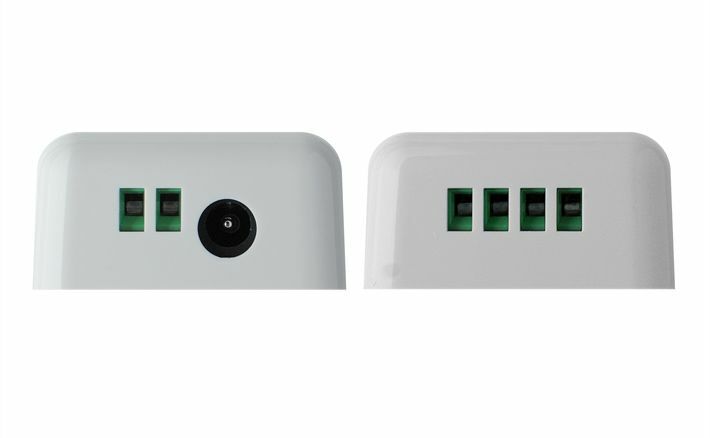 Perfect match for our Dual White ledstrip or 2 individual strips. 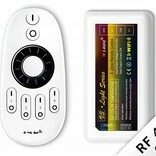 RF CT Color temperature controller with RF remote. 12A or 2X 6A (144 watts at 12 volts ). LED strip controller for Dual White LED strips or two individual LED strips with different color temperature (WW warm and CW Cool White) . 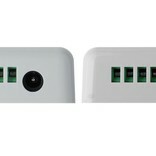 Control the white color temperature variable with this CT ledstrip controller set. 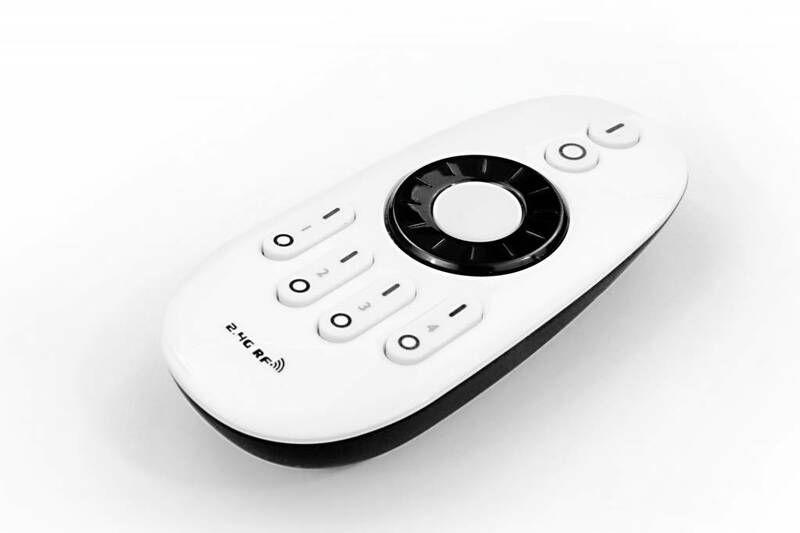 Choose an appropriate dim-level and color temperature with the easy to use jog shuttle on the stylish RF remote control. The controller and remote are multichannel, so you can easily extend your Dual White setup with bulbs or additional ledstrips. Adjust the color temperature to match the moment of the day: bright white on an overcast day, cosy warm white in the evening. 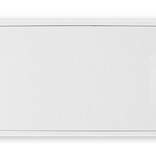 Also consider purchasing our super bright Dual white LED strip with both white color shades integrated into one compact LED strip . 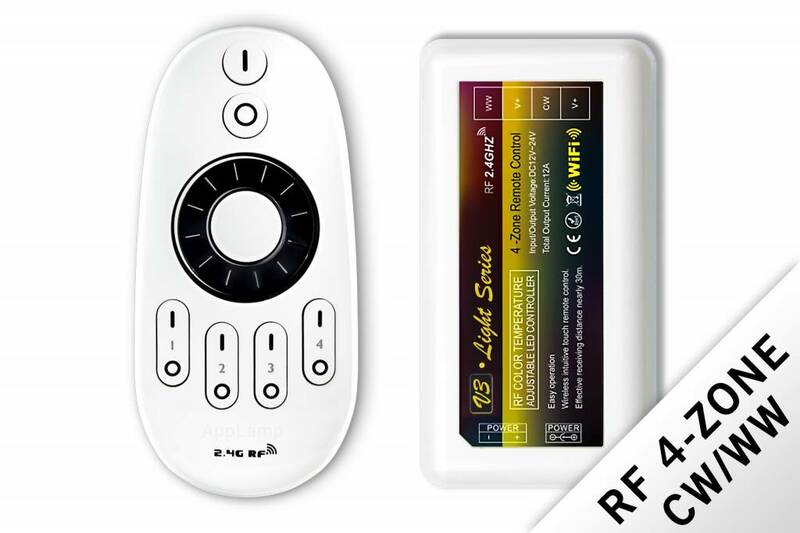 The CW/WW variable color temperature ledstip controller is accompanied by a powerful 4-channel RF remote control. Because of the used high frequency of 2.4G, the connection will always be interference-free. 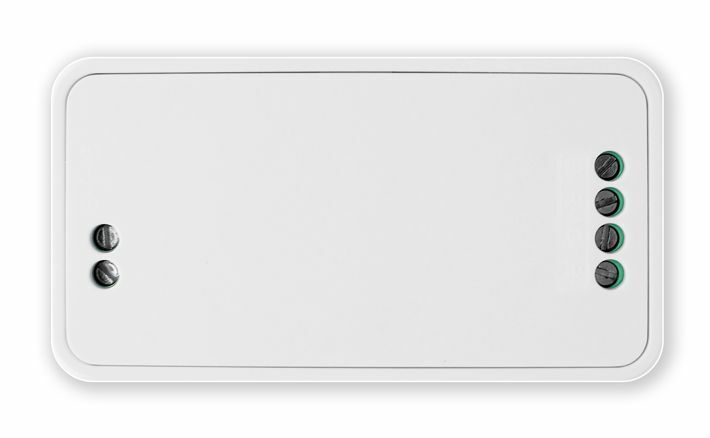 You will enjoy a wide reception range of up to 30 meters through walls! Use with 12 to 24 volt power supplies and LED strips. You can drive up to 10 meters Dual White LED strip (type 3014, 600 LEDs) or 2 X 5 meter LED strip (type 5050 , 300 LEDs) with the RF color temperature LED strip controller. This set does not include an adapter.